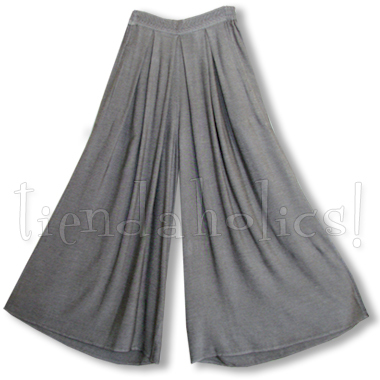 ALIA-SPECIAL: EXTRA-LONG PALAZZOS IN SILVER GRAY! Here's another fabulous style with traditional trapunto topstitching as just one of the many charms of these deliriously soft palazzos! They're cut extra w-i-d-e so they're roomy and comfortable and as fantastically yummy as your favorite jammies. They feature a front tab at the waist stitched in tribal chevron patterns—a VERY tummy-flattering feature—and around the back there's a comfortable wide elastic waist, stitched in rows to resist rolling. Gorgeous! The handmade quality of these free size pants is simply superior and gives them great durability. Express your inner WILD WOMAN every day... start with what you wear!